In general, jewelry items are small! This is because the components that make up the jewelry are costly--gemstones and precious metals--and the more there are, the more expensive the piece. Often, a person who is not familiar with jewelry may be surprised at how small a piece actually looks in "real life." Why? Because the photography that we use to show our jewelry virtually always shows the piece as a close-up. 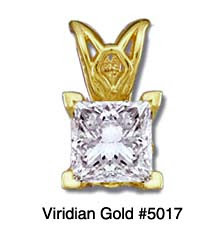 So, if you have been poring over photographs of diamond pendants, for example, you are seeing the items with much more detail than you would see if you examined the piece with the naked eye. For example, our 1/2 Carat Princess Diamond Scroll Pendant is shown to the left. That is the full size of the photograph, but the actual item is only 3/8" high by 1/4" wide, as per our specifications. On my computer monitor (set for 1280X1024), the pendant appears as about 3X actual size. If your monitor's resolution is less, it could appear much larger, say 4X actual size. Even though the item is small, it sells for around $1,300, primarily because of the size and quality of the diamond. We provide close-up photographs so that you can inspect the piece visually, in addition to consulting our detailed specifications which we provide for each item. We always provide you with the dimensions of the item, usually both in millimeters and in inches, as well as the weight in grams of the precious metal. You might wonder why we do not provide an "actual size" photo for each item--the reason we do not is because the size of the photography will change depending on the settings of your computer display! So, if we were to size a photograph to be "actual size" for one screen resolution, it could appear either bigger or smaller on another computer, depending on how its screen resolution was set up. So, whether you are shopping on our site or one of the may other Internet jewelry stores, always consult the physical dimensions and the metal weight of the items you are interested in, and use that information along with the photograph to form your opinion. If a merchant does not provide you with dimensions or weight, and especially information about the quality of the diamonds or other gemstones, you would do well to avoid purchasing from them!